This article was created in partnership with Google AdSense. Thank you for supporting the partners who make SitePoint possible. Effective websites build businesses. They raise your profile, strengthen your brand, and bring in new clients. They can also generate their own money, and the easiest way to get started is pay-per-click advertising. If that sounds like a lot of work, it doesn’t have to be. And it doesn’t have to turn your site into a flashy billboard, either. Once set up, your site will continue to generate supplementary income—even while you sleep. The sooner you get started, the quicker it will add up. So let’s get into it. Google AdSense is the easy way to start monetizing your content. After a simple setup process, you have access to the world’s largest network of online advertisers, and you get paid for every click, whether that visitor converts to a sale or not. Because the ads are relevant and unobtrusive, you keep faith with your visitors. Google is focused on good user experience, not confusing or misleading the user. When you win, they win. How much will you make? That’s hard to say, and depends on the quality and uniqueness of your site’s content, the amount of traffic you get, and even the type of traffic. So keep working on your site and content. Serious money may take thousands of visitors a day. But you don’t need to wait till then—see it as a work in progress. Make a start now, learn as you go, and track your progress over time. Auto ads make AdSense even easier to set up by using machine learning. Google intelligence does the work for you, choosing ads that will perform well, and placing them where they’ll have maximum effect. This is a game changer, allowing you to add ads to your site in a simple way, and make incremental revenue from them without the cost of additional time and effort. It does requires handing control over to Google, who uses page crawling techniques to analyze and understand each page, so that the AI can adapt to improve ad performance. And it works. During the beta test, participating publishers made on average 10% more revenue using Auto ads than they had been making on their own. 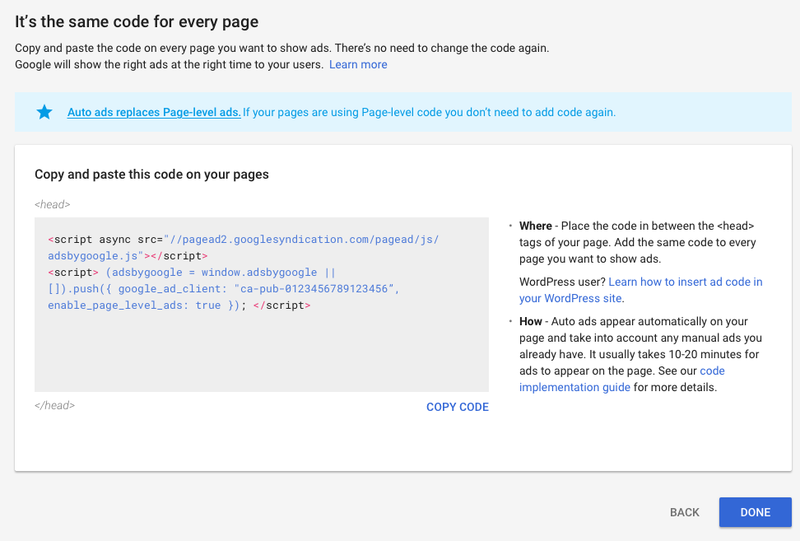 To get started, you just need to add a code snippet to each page you want ads on. After that you adjust the settings in your AdSense account by using the toggles to choose which ad formats are displayed, without ever having to edit the code. 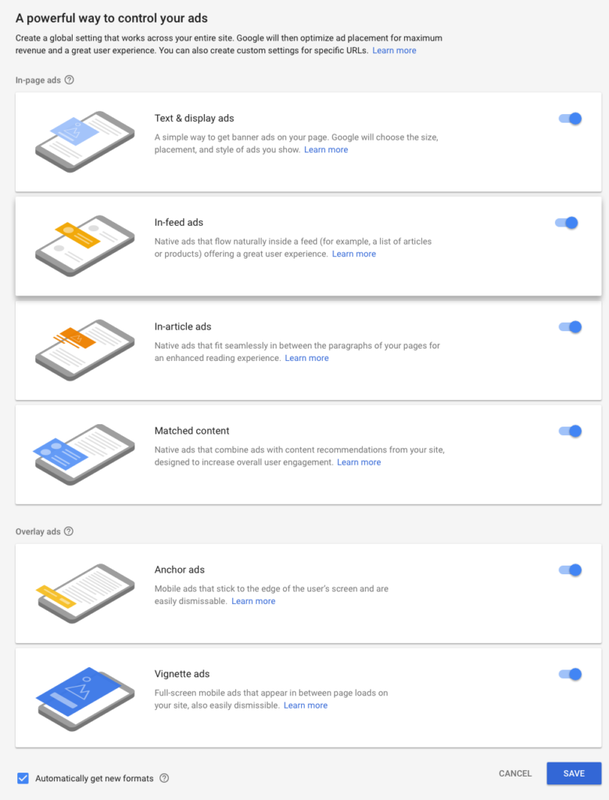 Additionally, make sure you take advantage of Ad sizes optimization, a feature Google added in 2019. It automatically optimizes your fixed-size ads on mobile, taking into account the screen size and orientation of your visitor’s device. There’s an application process you’ll need to complete before you can use AdSense on your website. It’s simple, free, and only takes a minute or two. Approval may take a few days. Head over to www.google.com/adsense and click on the “Sign Up Now” button. You just need to provide the URL to your website, and your email address. You can choose to opt in to AdSense emails, or not. That’s about it. Simple. Now that you have a new AdSense account, here’s how to get Auto ads up and running on your site. Log into your account and navigate to My Ads then Get Started. Select the ad formats you’d like to display, and click Save. You can adjust your choices at any time in the future. On the next page you’ll see a code snippet. For a static site, copy it, then paste it between the <head> and </head> tags of each page. It may take 10-20 minutes before the ads appear. Once you’ve installed and enabled your plugin, you’ll have to configure it to work with AdSense and Auto ads. Depending on which one you have chosen, that probably involves adding your AdSense publisher ID and enabling Auto ads in the settings, and you’re right to go. If you are using a lot of fixed-size ad units on your site you’ll want Google to optimize the ad size on mobile as well. Log into Adsense and navigate to Optimization, then the Opportunities page. Look for the Ad sizes setting in the “Optimization Settings” section, and select “Optimize 100% of mobile page views”. Long articles may look better if you display only in-article ads. You may decide to overlay an anchor or vignette ad on certain pages. And on other pages you may choose not to display any ads. There are a few ways to achieve this. For Auto ads, Google allows you to create URL Groups that can override your global ad settings with custom ones for specific sets of pages. Groups can be created by using domains, subdomains, directories or pages as criteria. While that’s useful, grouping pages by URL isn’t always the best way. WordPress plugins offer more power and flexibility by allowing you to use additional criteria. For example, Advanced Ads allows you to group posts by category, tag, taxonomy, author and age, and Ad Inserter Pro can use category, tag, taxonomy, post type, post ID and URL. If you’ve been thinking about monetizing your site for a while, I hope this article prompts you into action. Make a start, continue to add and improve your site’s content, and work at increasing traffic. Google can keep your ads relevant by automatically matching them to your content, and the more visitors you have, the more clicks too. The sooner start, the sooner you’ll start earning, and getting started isn’t hard. Signing up for Google AdWords is fast and painless, Auto ads make setup simple, and Ad Sizes Optimization makes your ads responsive with the click of a switch. Head over to https://www.google.com/adsense and sign up.